Its body length is between 15-24 cm, of which the length of the tail is 6-11 cm. Its colour is reddish brown. This species wears a black mask from its nose to its ears. 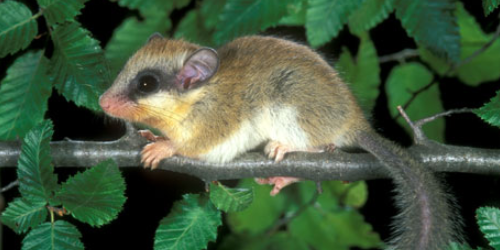 The forest dormouse consumes animals, especially insects. It occurs in mountainous forests. Its habitat represents species rich, deciduous forests, especially in xerotherm, oak forests, where the shrub layer and forest edges are well developed, yet the forest not is not closed. It also can be found in adjacent abandoned orchards. The major threat for the forest dormouse is the cut of mixed-species, the disappearance of wild fruits and the elimination of shrubs and shrubby forest edges. In addition, harvesting of dead trees and shrubs reduces its habitats as well as the creation of homogeneous oak trees. Furthermore, the clear cut of shrubby habitats, the deforestations of diversified oak and deciduous forests as well as the creation of large homogenous forest and clearings decreases the survival potential of the species. We can provide suitable habits for this species by increasing the species composition of forest edges and shrub layers. Also, by opening the closed the canopy of oaks forest by creating different sizes of sunny glades thus we could facilitate the appearance of flowering shrubs. Improvement in the species composition of tree species can be achieved through the promotion of the development of wild fruit trees and other rare species, and by planting shrubs into the glades and forest edges. Creation of different kinds of deadwood and installation of artificial nesting boxes further promotes the persistence of this species. Hecker, K. (2013): A magyarországi pelefajok (Gliridae) populációinak elterjedésökológiai vizsgálata két területen a Nemzeti Biodiverzitás-monitorozó Rendszer alapján. (Doktori értekezés) – Szent István Egyetem Környezettudományi Doktori Iskola, Gödöllő, 111 pp.